Optogenetics involves using pulses of light to stimulate cells in the brain. It is used as a promising form of therapy and has been employed in operations such as reversing blindness, blocking pain and resetting our biological clocks to help us sleep and perform better. And although this technique has picked up popularity, it is still a bit risky and depends on the light source used to examine the mushy contents inside our skulls. MIT, in collaboration with Harvard University, has come up with a solution that involves using a soft, stretchy optical fibre which could be used for optogenetics as well as acting as a warning light for diseases in other parts of the body. The hydrogel fibre is wrapped in polymer and is both as flexible as liquorice, but strong enough to resist being broken down. This makes it ideal to serve as a long-lasting implant providing long-term stimulation or therapy that avoids damaging the surrounding tissue. But the optical fibre can also be used to act more than just harmless brain corrective rays. The team took different sections of the fibre and coloured them with red, green and blue dyes. After shining a laser through its length the red section was stretched out, and by analysing the intensity of the red light that went through to the other side, the team was able to determine the exact part of the fibre that was stretched. “When you stretch a certain portion of the fibre, the dimensions of that part of the fibre changes, along with the amount of light that region absorbs and scatters, so in this way, the fibre can serve as a sensor of strain,” says MIT graduate student Xinyue Liu. 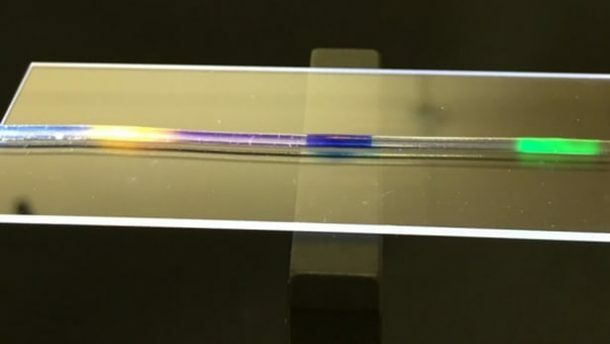 The significance of this discovery is that the fibre can now be used as an implantable or a wearable strain gauge which could be applied to the length of a patient’s arm or leg and tracking mobility of the limb after an injury. And with certain advancements, it could also be used if it reveals early signs of disease through inflammation and the monitoring of tumours. What are your thoughts on this fascinating research? Comment below!